Wall Street is buzzing about blockchain. Nasdaq CEO Bob Greifeld has said his company needs to be a "rapid applier" of the technology . JPMorgan earlier this year launched a trial project with the blockchain startup led by its former executive, Blythe Masters. Autonomous Research has called the technology a " game changer. " It promises to improve security, lower costs and increase the speed of transaction settlement. You can read a fuller explanation here. Goldman Sachs, which has previously said the technology " has the potential to redefine transactions ," has a big note out about blockchain and its potential applications. In particular, it takes a look at how blockchain could be applied in the US stock market. The headline: the use of blockchain technology in stock trading could result in $6 billion in industry cost savings globally. 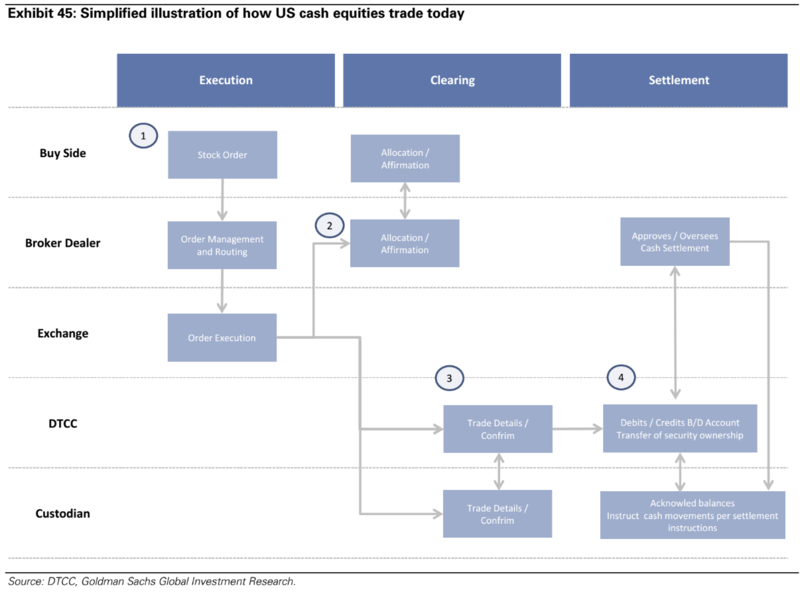 We believe blockchain could drive greater efficiencies in the US cash equities market, primarily through streamlining the post-trade settlement and clearing processes. By reducing the duplicative, often manual affirmation and reconciliation of trades across buy-side clients, broker-dealers, trust/custody banks, and the Depository Trust & Clearing Corporation (DTCC), we believe blockchain could result in an estimated ~$2 bn in annual cost savings in the US (both explicit and economic costs). On a global basis, the benefits would likely exceed $6bn in annual savings assuming costs are proportionate to market cap. As the chart below highlights, the execution portion of a stock trade is pretty simple. It is the clearing and settlement portion where it gets messy, and where blockchain could add value. We believe most of the benefits that blockchain could bring to US cash equities trading are in the clearing and settlement processes, specifically: reducing or eliminating trade errors, streamlining back office functions, and shortening settlement times. Essentially, by enforcing agreement at the time of entry, blockchain could eliminate some of the most common post-trade issues and errors, such as incorrect settlement instructions or incorrect account/order details. Today, these details are confirmed/affirmed by multiple parties (DTCC, custodians, broker/dealer, clients) and multiple times throughout the life cycle of the trade. If blockchain could be fully implemented across these parties, many of these attributes could be included in a smart contract, thus becoming a pre-trade requirement to execute an order rather than a downstream, post-trade check that requires multiple parties to agree. Now, you'll notice the words could and if appear pretty often when people talk about blockchain. We've noted before that while the technology does have some interesting applications, it is also a long way from taking off in trading. Goldman makes the same point, saying that while certain applications could appear pretty quickly, such as those in social media or the sharing economy, it is going to take some time for blockchain technology to become widespread in highly-regulated industries such as finance. In capital markets, we expect to see a series of early prototypes over the next two years on a limited scale and with limited numbers of participants. Broader market acceptance is likely to take as much as 10 years given the regulatory oversight required and large number of market participants in large-scale markets such as cash equities in the US. Still, given the cost pressures in the investment banking business right now , it isn't surprising banks are getting so excited about the technology's potential, even if the benefits are some way off.